This book is for sale by Friends of Bluemont through special arrangement with the Bluemont Citizens Association. 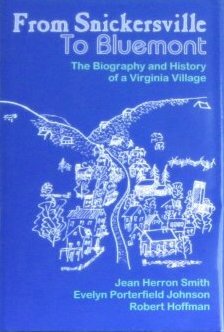 Snickersville, the Biography of a Village - This section is basically the detailed history compiled by Jean Smith for the first edition of this book. One part provides genealogy information on the old families of the village and another identifies reference sources. Thomas Osburn's Account of Bluemont in the 1850s, published in 1923 by the Loudoun Times. Includes list of villagers who entered the Confederate Service, from Snickersville, and the Command to which they belonged." Dr. Plaster's Account, providing history of Snickersville/Bluemont from 1769 to 1900, with emphasis on the colorful character of the village in the late 1800s. A Letter from Jennie Purcell Carrothers, written by the grandmother of longtime Bluemonter Linda Corley, which relates "a young girl's experiences during the war between the states." Scanned handwritten letter. On Every Height There Lies Repose, a promotional and informational brochure about the Blue Ridge, published about 1900 by the Southern Railway. Scanned brochure. Interviews with Bluemonters: Earl Iden (1978 - by Sharon Fleming), Martin Mitchell (2000), Sonny and Betty Colbert (2003), Bud and Judy Anderson (2003) (the latter three by Evelyn Porterfield Johnson). A section dubbed "Life in Bluemont" contains key dates and photos of the Railroad in Bluemont; the Post Office, and the retail stores. The "Picture Album" includes a 1919 Bluemont telephone book, advertisements, and much, much more. "The tidal variation of village life is fascinating for those who take the time to explore. From conscription of soldiers for the Revolutionary War, to active involvement in the Civil War to its rise as a comparatively major commercial and resort area, Bluemont grew. It had many merchants, hotels, and an ornate train depot. However, beginning with the Depression, Bluemont became disconnected and declined. Train service stopped and stores became vacant. The rise of the automobile and the decline of farming each made their contributions. Now better roads and greater urban housing pressures are pushing Bluemont back up the slope. We do not know what the next 300 years will hold, but an understanding of the last 300 is essential to help us plan and persevere." [from book jacket. Copyright 2003 by the Bluemont Citizens' Association, all rights reserved.